Description: Oil painting by C.C.A. Christensen on display at the Springville Art Museum. Image courtesy of: Springville Art Museum, The Springville Museum of Arts in Springville, Utah, is Utah's oldest museum for the visual arts, housing over 1,500 works of art. Between 1849 and 1855, 16,000 European emigrants came to Utah. The PEF spent 125,000 English pounds between 1852-5. In 1855, 4,225 emigrated, of which 1,161 were assisted by the PEF at a cost of $150,000. PROBLEM: Summer of 1855 was hot and dry. Irrigation supplies were depleted and that fall the grasshopper plague hit. Harvest was reduced 1/3 in some areas, 2/3 in others. Food would need to be rationed. Increased emigration added to unemployment. There was a dramatic decrease in tithing receipts and contributions to the PEF. The General Epistle of Oct. 29, 1855, announced that emigration should not be reduced. Despite heroic efforts, only 1 in 20 of those wishing to emigrate had been able to do so. SOLUTION: Handcarts. B. Young wrote the European Mission, Sep. 1855, suggesting that even 15 miles a day would bring them to Salt Lake City in 70 days and realistically, much sooner. They would need provisions for 90 days from the Missouri River, some bedding, and a change of clothes - no chests, luggage, freight, etc. Great time would be saved not looking after animals. The PEF plan (outlined in the "Thirteenth General Epistle," Oct 29, 1855): One handcart for every 5 persons, 5-600 pounds per cart, 15 pounds extra clothing per person, 1 tent for every 20, and a few wagons for every company to carry the tents and extra food, only the "honest" poor (the Church had already had bad experiences of paying for persons not belonging to the Church or belonging in order to get to the US and then leaving the Church and never repaying the loans). Europe was in a devastated condition economically, and the members were extremely enthusiastic for the chance to pull or push a handcart to Zion. Smokers and tea drinkers resolved to quit and put the savings into the PEF. 1856 marked a change from emigrants sailing to New Orleans and up the Mississippi to St. Louis and then to Council Bluffs on the Missouri. The railroad made it possible to travel by rail to Iowa. Iowa City was designated the spot to build and outfit the handcarts. All further emigration would be through New York or Boston. The first PEF emigrants (431) in 1856 (therefore, first two handcart companies under Captains Ellsworth and McArthur) were part of 534 Saints that sailed from England, March 23, 1856, on the ship, "Enoch Train," a model of which is in the Church History Museum. The winter of 1856 was especially hard in Europe, work was scarce and prices were high. Enthusiasm was so high for gathering to Zion (numerous fiery articles appeared in the Millennial Star, songs were written and sung, among which were "O, Ye Mountains High," "High On The Mountain Top," "Ye, Elders Of Israel," "Israel, Israel, God is Calling," and the handcart song, "Some Mush Push and Some Must Pull," some had quit their jobs and sold property before arrangements had been made for transportation. Poor sailing conditions and increased demand for the northern route, pushed prices up and availability of ships down. Faced with the choice of remaining in England starving, going to the poor house, or risking a late journey across the plains, over a thousand chose the latter. The Willie company left England for New York, May 4th, with 484 PEF and 280 ordinary emigrants (764 total). The Martin company left England for Boston, May 25th, with 635 PEF and 221 ordinary emigrants (856 total). By Florence the company was down to 576 persons. Reasons for delays: Schedules were missed, communication between England and Iowa City was slow and inadequate, more people came than was expected, requiring more handcarts and tents, and these were just some of the problems that faced these 1,620 late emigrants. The Willie Company was delayed in Iowa City 19 days, the Martin Company, 20. Behind them came 2 ox trains. First Handcart construction: (Brigham suggested they be made without metal.) Josiah Rogerson's account; "The carts were the usual width of the wide track wagon. Across the bars of the bed of the cart we generally sewed a strip of bed ticking or a counterpane (embroidered quilt, bedspread). On this wooden cart of a thimbleless axle, with about a 2 1/2 inch shoulder and 1 inch point, were often loaded 400 or 500 pounds of flour, bedding, extra clothing, cooking utensils and a tent. The covered or family cart was similar in size and construction with the exception that it was made stronger, with an iron axle (others were hickory). It was surmounted by a small wagon box 3 or 4 feet long with side and end pieces about 8 inches high. Two persons were assigned to the pulling of each open cart, and where a father and son of age and strength were found in one family, with smaller children, they were allotted a covered cart, but in many instances the father had to pull the covered cart alone." Handcarts of Willie and Martin (4th and 5th) companies that year: John Chislett's (sub-captain) account; "They were made in a hurry, some of them of very insufficiently seasoned timber, and strength was sacrificed to weight until the production was a fragile structure, with nothing to recommend it but lightness. They were generally made of two parallel hickory or oak sticks, about 5 feet long, and 2 x 1 1/2 inches thick. These were connected by one cross-piece at one end to serve as a handle, and 3 or 4 similar pieces nearly a foot apart, commencing at the other end, to serve as the bed of the cart, under the center of which was fastened a wooden axle-tree, without iron skeins. A pair of light wheels, devoid of iron, except a very light iron tire, completed the "divine" handcart. Its weight was somewhere near 60 pounds. Handcart companies #1 and #2. The first two handcart companies came on the same ship, left Iowa City 2 days apart and stayed closely associated until reaching SLC. Edmund Ellsworth was Brigham Young's son-in-law, having married Brigham's oldest daughter. At Florence, a tinner by trade, with a box of tin with him, was asked by Capt. Ellsworth to wrap every handcart axle with tin. Working morning and night, he did. Archer Walters, a carpenter, made handcarts and coffins for the first company. His wife, Harriet, was sickly the early part of the trip, and Archer pulled her in his handcart much of the early part of the trip. By Casper, she was doing better and able to walk the whole way each day. He died 2 weeks after reaching SL. He was 47 and left a wife and 5 children. He kept a journal, including the story of Brother and Sister Parker's boy, age 6, who was lost, July 1st, 23 days after leaving Iowa City, and 7 days before the company reached Florence, Neb. Bro. Parker went back to find him. July 5th - "Bro. Parker brings into camp his little boy that had been lost. Great joy through the camp. The mother's joy I can not describe." The Parkers were travelling with the 2nd company with their 4 children: Max, 12; Martha Alice, 10; Arthur, 6; and Ada, 1. According to their family account, "One day little Arthur sat down to rest, unnoticed by the other children. A sudden storm came up, and the company hurriedly made camp (July 1st). Finding that Arthur was not with the children, an organized search was begun. It continued a second day, but without success. "Ann Parker pinned a bright shawl about the thin shoulders of her husband and sent him back alone on the trail to search again for their child. If he found him dead, he was to wrap him in the shawl; if alive, the shawl would be a flag to signal her. Ann and her children took up their load and struggled on with the company, while Robert retraced the miles of forest trail, calling, and searching and praying for his helpless little son. At last he reached a mail and trading station where he learned that his child had been found and cared for by a woodsman and his wife. He had been ill from exposure and fright. But God had heard the prayers of his people. "Out on the Trail each night Ann and her children kept watch and, when, on the third night, the rays of the setting sun caught the glimmer of a bright red shawl, the brave little mother sank, in a pitiful heap in the sand. . . Ann slept for the first time in 6 days." (C.W. Judd's account in Kate B. Carter Treasures of Pioneer History) DUP, 1956, pp. 240-42. Dropouts: The Millennial Star, in 1856, indicated that from 5 to 50 (2 - 17 percent) in a company of 300 would drop out by the time Florence was reached because they forgot God, were lured by the promise of high wages, or lacked the faith to handle adversity. Mary Ann Jones, future wife of Captain Ellsworth (1st company), "I never left my handcart for a day, and only rode over 2 rivers. Twiss Bermingham, diarist for the 2nd company, (5 days west of Florence), "Rather weak this morning and terribly annoyed by two boils, one on my jaw about as big as a pigeon egg and another on the calf of my leg which torments me very much when drawing the handcart. "29th (July). Boils very sore this morning but must draw on the cart still. With such sores at home I would lie upon two chairs and never stir until they were healed. Started early this morning and traveled 20 miles. "31st. Left Loupe-Fork and traveled 20 miles without water. I was so exhausted with my sores and the labor f pulling that I was obliged to lie down for a few hours after arriving in camp before I could do anything. Kate was also so tired and fatigued out that she was glad to get lying down without any supper and I was not able to cook any for ourselves so we were obliged to do with a bit of bread and a pint of milk. This is the quantity of milk we have been allowed morning and evening since we left Florence. Sometimes it is less. Rather little for 5 persons. "3rd August. Sunday. Started a 5 o'clock without any breakfast and had to pull the carts through 6 miles of heavy sand. Some places the wheels were up to the boxes and I was so weak from thirst and hunger and being exhausted with the pain of the boils that I was obliged to lie down several times, and many others had to do the same. Some fell down. I was very much grieved today, so much so that I thought my heart would burst - sick - and poor Kate - at the same time - crawling on her hands and knees, and the children crying with hunger and fatigue. I was obliged to take the children and put them on the hand cart and urge them along the road in order to make them keep up. About 12 o'clock a thunder storm came on, and the rain fell in torrents. In our tent we were standing up to our knees in water and every stitch we had was the same as if we were dragged through the river. Rain continued until 8 o'clock the following morning." Snake bite. In this same company, Aug. 16, 2/3 of the way to Ft. Laramie, according to Capt. McArthur, "...while crossing over some sand hills, Sister Mary Bathgate was badly bitten by a large rattlesnake, just above the ankle, on the back part of her leg. She was about a half a mile ahead of the camp at the time it happened, as she was the ring leader of the footmen or those who did not pull the handcarts. She was generally accompanied by Sister Isabella Park. They were both old women, over 60 years of age, and neither of them had ridden one inch, since they had left Iowa camp ground. ...As soon as we heard the news, we left all things, and, with oil, we went post hast. When we got to her she was quite sick (her leg had swollen to 4 times normal size), but said that there was power in the Priesthood, and she knew it. So we took a pocket knife and cut the would larger, squeezed out all the bad blood we could, and there was considerable, for she had forethought enough to tie her garter around her leg above the would to stop the circulation of the blood. We then took her and anointed her leg and head, and laid our hands on her in the name of Jesus and felt to rebuke the influence of the poison, and she felt full of faith. We then told her that she must get into the wagon, so she called witnesses to prove that she did not get into the wagon until compelled to by the cursed snake. We started on and traveled about two miles, when we stopped to take some refreshments. Sister Bathgate continued to be quite sick, but was full of faith, and after stopping one and a half hours we hitched up our teams. "As word was given for the teams to start, old Sister Isabella Park ran in before the wagon to see how her companion was. The driver, not seeing her, hallooed at his team and they being quick to mind, Sister Park could not get out of the way, and the fore wheel struck her and threw her down and passed over both her hips. Brother Leonard grabbed hold of her to pull her out of the way, before the hind wheel could catch her. He only got her out part way and the hind wheels passed over her ankles. We all thought that she would be all mashed to pieces, but to the joy of us all, there was not a bone broken, although the wagon had something like two tons burden on it, a load for 4 yoke of oxen. We went right to work and applied the same medicine to her that we did to the sister who was bitten by the rattlesnake, and although quite sore for a few days, Sister Park got better, so that she was on the tramp before we got into this Valley, and Sister Bathgate was right by her side, to cheer her up. "Both were as smart as could be long before they got here, and this is what I call good luck, for I know that nothing but the power of God saved the two sisters and they traveled together, they rode together, and suffered together. "Sister Bathgate has got married since she arrived in the Valley. Deer Creek - This company took on 1,000 pounds of flour (sent from SLC). It is assumed that the first company did likewise. Pacific Springs - Took on another 1,000 pounds of flour. Camp Grant - The first company camped there, Sep 25, and was escorted into the city by Brigham Young, Heber Kimball, a brass band, and a detachment of Lancers on the 26th. The carts were pulled by succession of old, middle-aged, and young of both sexes. They were embraced by friends and relatives and treated to melons. Mormon Flat - The second company camped here, Sep 25, and before sunset, the 26th, hiked all the way to Emigration Square, in SLC and participated in the same arrival celebration as the first company. "I have had to labor with the people incessantly to keep faith in them, ...by showing them that there was honor attached to pulling handcarts into the valley..."
Company #3 - The "Welsh" company, under Capt. Edward Bunker, age 34, spoke little english. It took 65 days for the 320 persons and 64 carts to make the trip from Florence. They tried to average 20 miles per day. There were 18 cows along, which provided milk and enough beef cattle to kill one a week for food. They had a pound of flour per person plus a little coffee, sugar, and rice. They killed 3 buffaloes. They ran out of flour, somewhere, and it was two days before they were resupplied from Salt Lake. Mrs. Evans (Heart Throbs, VI, pp. 355-6), did not speak Welsh and was assigned to a tent with a dozen others, one of which (her husband) had one leg, two were blind, she was 6 months pregnant when she reached SL, a man with one arm, and a widow with 5 children. "After months of traveling we were put on half rations and at one time, before help came, we were out of flour for two days. During this hard journey I was expecting my first baby and it was very hard to be contented on so little food. My husband had lost a leg in his early childhood and walked on a wooden stump, which caused him a great deal of pain and discomfort. When his knee, which rested on a pad, became very sore, my husband was not able to walk any farther and I could not pull him in the little cart, being so sick myself, so one late afternoon he felt he could not go on so he stopped to rest beside some tall sagebrush. I pleaded with him to try to walk farther and I could not pull him in the little cart, being so sick myself, so one late afternoon he felt he could not go on so he stopped to rest beside some tall sagebrush. I pleaded with him to try to walk farther, that if he stayed there he would die, and I could not go on without him. The company did not miss us until they rested for the night and when the names were checked we were not among the company and a rider on a horse came back looking for us. When they saw the pitiful condition of my husband's knee he was assigned to the commissary wagon and helped dispense the food for the rest of the journey. I hated to see him suffer so but it was with relish that I ate his little cake when he was too miserable to care for food." Mrs. Evans baby was born less than 3 months after her arrival in the Valley. One of the blind men mentioned above was Thomas B. Giles, widely known later as "The Blind Harpist." With a wife and baby girl and two boys, aged 7 and 9, he pulled his handcart westward. (Heart Throbs, X, pp. 325-6), "Soon after starting across the plains, the baby became ill and died. She was buried beside the trail and the company moved onward. A few weeks later, his wife died. She also was buried beside the trail. The two boys, because of their father's condition, were sent back to join another company which included a group of Welsh emigrants (probably the Dan Jones, later Hunt, wagon train that was 5 weeks behind). Sweetwater Station. Somewhere on the Sweetwater (I calculate about Sweetwater Station) "Elder Giles himself became seriously ill. After holding the company for two days, Captain Bunker ordered the camp to move on, leaving two of the men to bury the sick man when he died. It was expected that death would come in a matter of hours. "Remarkable faith and the frequent administrations of the Elders who attended him kept the patient alive until evening when Parley P. Pratt the Apostle, who had known Brother Giles in Wales, reached the camp. Elder Pratt gave Brother Giles a remarkable blessing. In it he made these promises: he should instantly be healed and made well, that he should rejoin his company and arrive safely in the Salt Lake Valley; that he should there rear a family; and that because of his faithfulness he should be permitted to live as long as he wanted. These blessings were all fulfilled in their entirety. "Elder Giles rejoined his company, reached the Valley, Oct. 2, 1856, remarried, and lived to bless and name 7 of his grandchildren. His death occurred, Nov. 2, 1895, after he expressed a desire to go." Elder Giles specialized in music. He played the harp and sang hymns and popular songs. He traveled about the state giving concerts and playing for dances. HIS HARP IS IN THE SL DUP MUSEUM. Samuel Brooks left Iowa City with 3 children, Mary, age 14, George, 12, and little crippled Frank, 5. The father and mother pulled the cart, while the two older children pushed behind and little Frank rode on top of the load. The mother was small and of a quick nervous temperament, and the hard work and long hours proved too much for her. She sickened and died after a brief illness, and was buried in the cemetery at Florence, Nebraska. The two children helped push and pull. Rations shortened, but the father encouraged them by promising an end to hunger when they reached the Valley. Relief at the end of the journey was overshadowed by illness; the father was taken away from the public tend, evidently so that he could be better cared for. The children did not know where he was taken or by whom, when he died, or where he was buried. They were told only that he was dead, as much a victim of the long trek as though he had died on the way. Pictures of numerous players in the handcart drama are pictured after page 90 in "Handcarts to Zion." Willie Company (#4). Single men were divided among the families to balance the strength. Some carts were pulled exclusively by young girls. Two tents were occupied only by single women. Only 4 of the group had been to the Valley previously, Willie, Atwood, Savage, and Woodward. These and others talked at a meeting to discuss whether they should winter over or continue the trip. Levi Savage offered the only dissenting voice, saying they could not cross the mountains with a mixed company of aged people, women, and little children, so late in the season without much suffering, sickness, and death. He advised going into winter quarters without delay. Savage was voted down, the majority being against him. He then added: "Brethren and sisters, what I have said I know to be true; but seeing you are to go forward, I will go with you, will help you all I can, will work with you, will rest with you, will suffer with you, and, if necessary, I will die with you. May God in his mercy bless and preserve us." 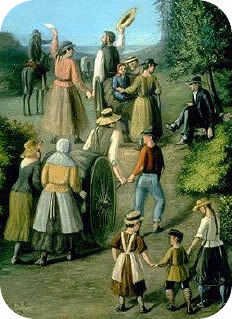 For more information, see pages 101 - 141 and 222 - 256 in "Handcarts to Zion." Martin Company (#5). This company took the longest, had the most people - more old, young, and handicapped of any company. It started the latest in the year with the poorest quality handcarts and suffered the worst weather in decades. Many of the well-known stories of suffering and rescue involve this company. The story is well told in various books, including "Handcarts to Zion," and "Rescue of the 1856 Handcart Companies," by Rebecca Bartholomew and Leonard J. Arrington.